Opening night at Enlighten is a huge success | Where to next? 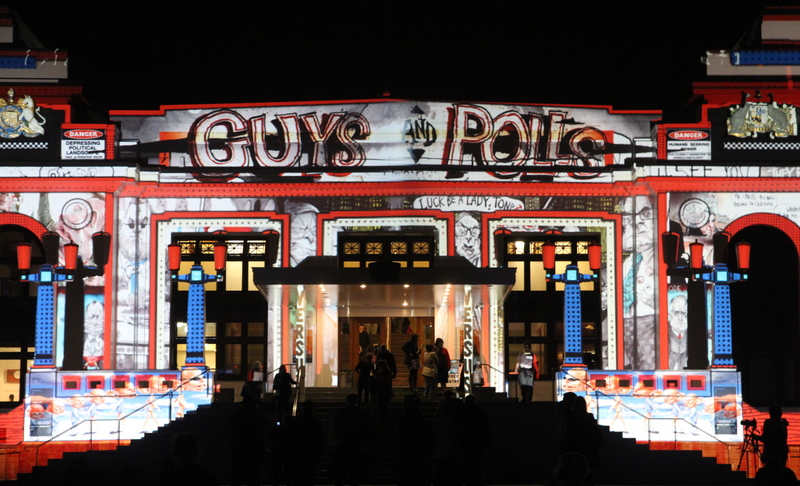 Canberra’s annual Enlighten event kicked off Friday with great weather and at least 10,000 people turning out to see six national buildings bathed in colourful artworks through the magical of projectors. 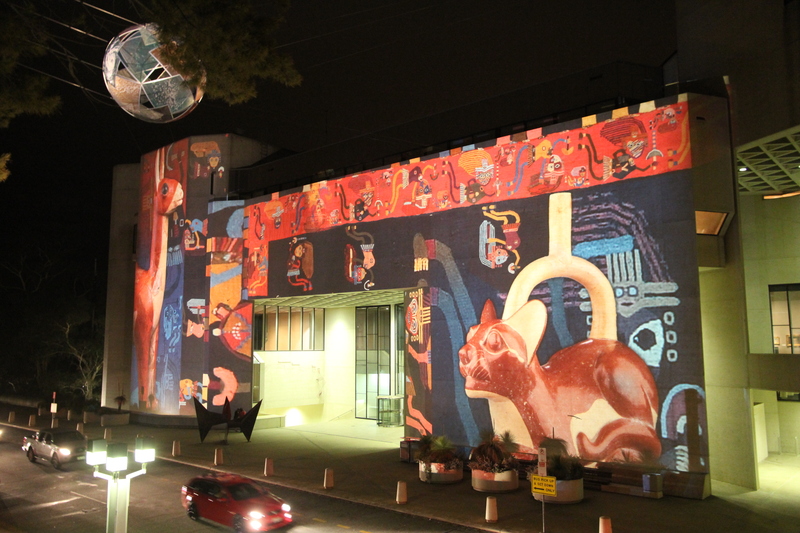 Started in 2011, Enlighten marks the beginning of autumn and is a lead-up to celebrating Canberra Day, which is observed each year on the second Monday in March. Poor John and I arrived soon after the lights were switched on, and already there were crowds surging around the National Gallery, where we parked and started our walk to see all the displays. The gallery was showing off images of the breathtaking artworks in their current exhibition, Gold and the Incas: Lost worlds of Peru. Images cycle every couple of minutes, so it’s ideal to linger for 10–15 minutes at each building. 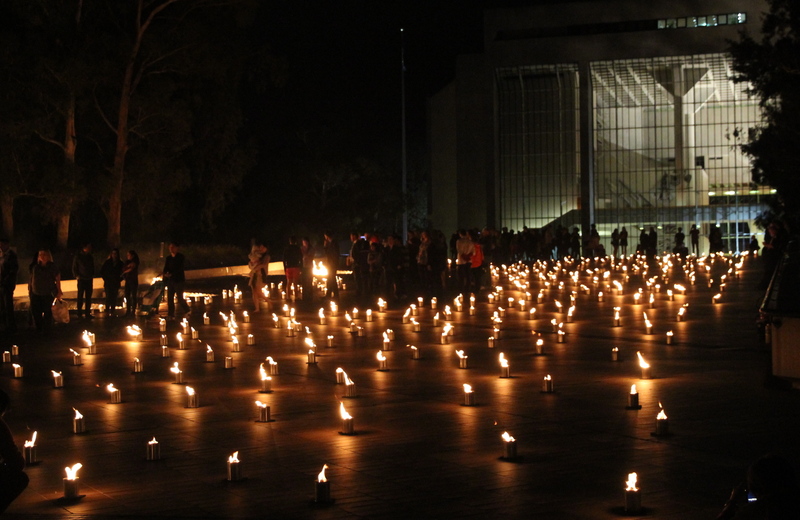 From the gallery, we moved on to the High Court and its Fire Garden. This is the first year I remember there being a display at the court. Pippa Bailey created this artwork that had fire canisters on the court’s entry ramp and large fire displays positioned in the court’s decorative and cascading fountain. Next stop was the National Portrait Gallery. It’s a long low building filled with paintings, sculptures and photographs of Australia’s greats and not-so greats. It also has a special photography exhibit, Elvis at 21. This collection has 56 black-and-white pics of a young Elvis before his rise to fame. Photojournalist Alfred Wertheimer took the pictures following a photo shoot commissioned by RCA Victor, which had recently signed Elvis. Be quick if you want to see it, because it ends 10 March. 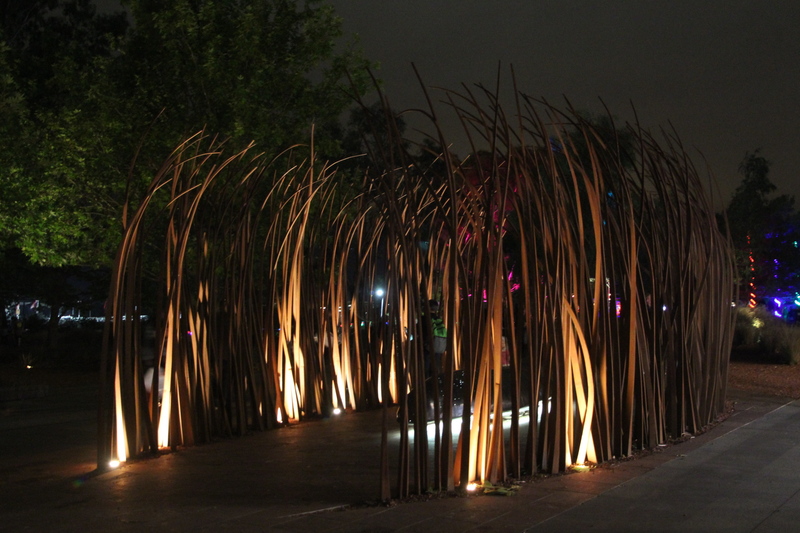 Then it was on to Reconciliation Place, Questacon and John Dunmore Lang Place. Reconciliation Place is a symbol of the government’s commitment to the ongoing reconciliation with the Indigenous people of Australia. It has 17 important artworks. One of my favourites is fire and water by Judy Watson. Questacon, our science and technology centre, has a wonderful cube shape and is perfect for architectural projections. This year, visitors are able to ‘splash’ colour onto the building’s exterior. Poor John and I opted to leave this fun to the many young children waiting for a turn. Nearby was the Circle of Light. Visitors were welcome to manipulate the controls to change the colour and movements of the 12 robotic searchlights. 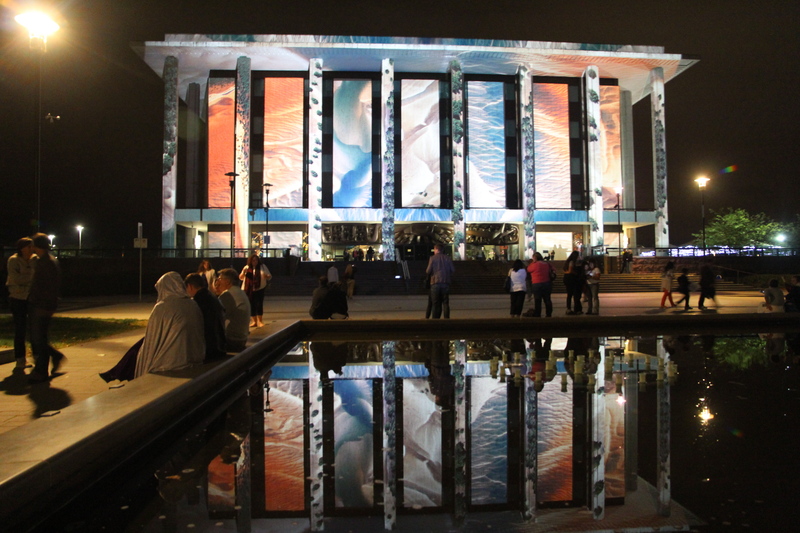 The National Library is another interesting surface for displaying the projections. Its many columns make it reminiscent of the Parthenon in Greece. We lingered there for quite a while, enjoying the seven or so different images and the reflections they made on the pond in front of the library. The library found my blog and sent along a link to a short video they made of Enlighten at their place. It’s fantastic, so I urge you to check it out. Our last stop on Friday was Old Parliament House. By day, it’s a pure white building, but Enlighten brings out its wonderful architectural lines. We didn’t get up to the current Parliament House this time, but will pay a visit this coming weekend when Enlighten has it’s final two nights. I’m also keen to see the 12-foot-tall horse puppets scheduled for Friday and Saturday. There are plenty of other activities going on and organisers are hoping that more than 115,000 people will attend the free and ticketed events on offer. So can we put you down for Enlighten next year? I am so glad you found us. This is wonderful. I still have some pics to send to you from our time in Halong Bay, but I can’t get them off an old computer. I’ll keep trying and hope to send then to you soon. Hope you are well. G’day! Looks to be a fantastic fun night with so much to do! GREAT photos!! It’s a great night, in fact four great nights. Maybe you’ll make it here one year. You are most welcome to join us next year. 🙂 I should post of pic of Fire and Water in daylight. It’s a gorgeous sculpture round the clock. And yes, some of the mosaic is a close-up of Inca jewelry. Very nice, interesting…. the words “Eye Candy” comes to mind; Something purely aesthetically pleasing, that is, pleasing to the senses. Can be a person, a film, a sunset, a flower, or anything else you can see (Urban Dictionary). It is Eye Candy. What a great description. Don’t know what else to say – but – WOW! Thanks so much for sharing the link. I’m going to add it to the body of the blog too.